It is almost like an app pool problem. I checked my logs and it happens after the app pool restarts. Not every time, but more often than not. It's the same scenario on mine. Something is not clearing out completely or unable to initialize properly after a restart. It happens at the same 'sequence' - not random as to when it occurs. I'll start another thread later after I pull down a copy of the database and sitecode that is the problem site -- I'll move it to my dev server and recompile that release in debug so I can try to see what's happening. Problem is it happens on init - so most debug info has no role, as the app has not even started up -- it's dying at the profile provider init. While that used to help in the past, I have adopted a new config setting in the web.config per Jaben (posted here in another thread) that changed our startup times to next less than 5 seconds 99% of the time on both sites (1.9.6.1 and 2.0 beta) - both sites used to startup slow, and as such, both have 600 for the delay. That's a 10 minute startup delay. I don't know anyone who will wait for 10 minutes for a site to startup. Regardless of that, it's not a timeout issue. There's something else going on. This didn't appear until the 2.0 betas - my 1.9.6.1 site has a 400meg db with over 250k posts and 2k users. It starts up no problem every time. The 2.0 site has 175k posts and 800 users and that's the one that fails to startup with the same above error. In my case, it takes a restart of the SQL server then a restart of the APP pool to clear it. It seems to happen any time the app can't get a clean shutdown (ex: app pool shutdown time limit is 90 seconds per IIS (default setting) -- if it takes longer than that, it is forcibly closed by IIS. If this happens, or it dies without being able to shutdown the pool cleanly, I get the above, same as SteveinTN. For what it's worth, mods really need to split this into another topic in the bugs forum. 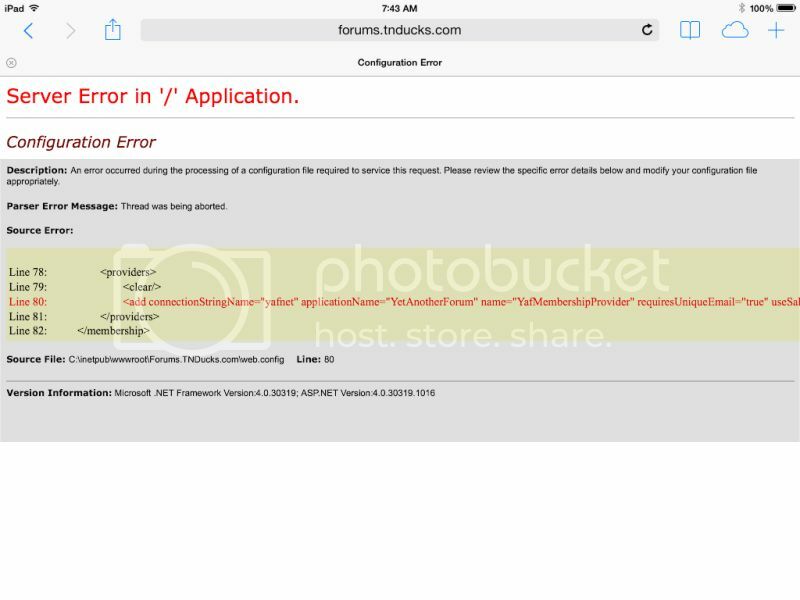 Have had this problem too when IIS recycles the app pool in 2.0.0. For me, it helped by do a manual recycle of the IIS app pool, and I also guess it is an app pool shutdown problem in the automatic recycle process due to an unreleased/hanging software thread. Since I update the forum software weekly, it seems like the problem is fixed somewhere along the way towards 2.1 since I haven't had any problems with this in about the last 2 weeks.